This Apple Goat Cheese Arugula Salad with homemade honey balsamic vinaigrette paired with Michael Angelo’s Eggplant Parmigiana helps turn frozen meals into a memorable dinner. Something you may not know about Roger & I is that we love keeping our freezer packed full of delicious food. We have a fairly large freezer & I can’t remember a time when our freezer wasn’t completely packed to the point of not being able to close the door. I want to blame Roger for our freezer being bursting with yummy food (because every time we go grocery shopping together he has to buy ice cream), but I have my fair share of individual meals packed in there for busy weekday lunches. 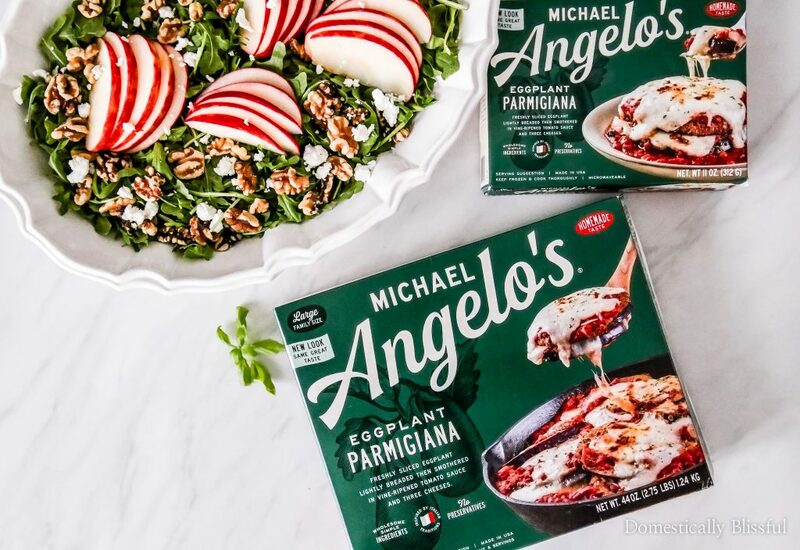 And sometimes the evenings, especially around the holidays, are just so busy you need a helping hand from your favorite frozen meals, like Michael Angelo’s at Walmart! We’ve been so busy making sure our house is always show ready for potential buyers we haven’t had a lot of time to prepare a full meal. 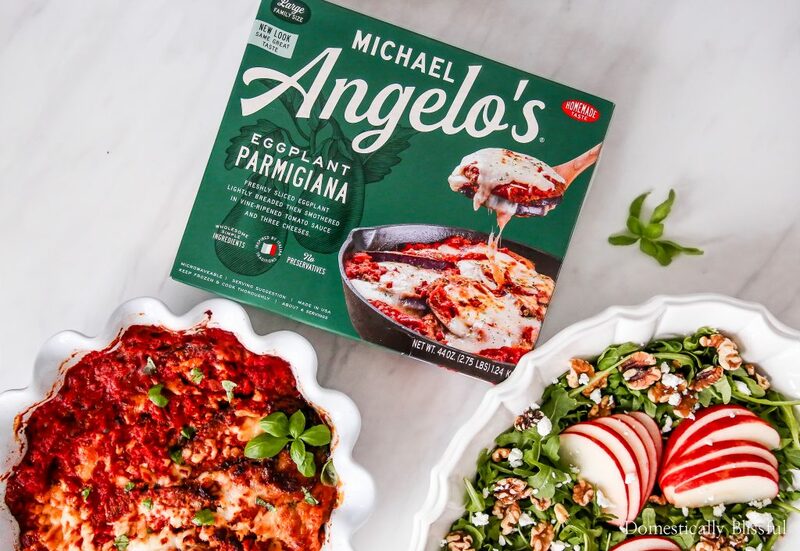 Whether you are preparing a meal for a family, or a quick one just for you, Michael Angelo’s is an easy choice with their family-favorite & single-serve meals that are ready in minutes. Plus they pair perfectly with warm garlic bread or a fresh salad. 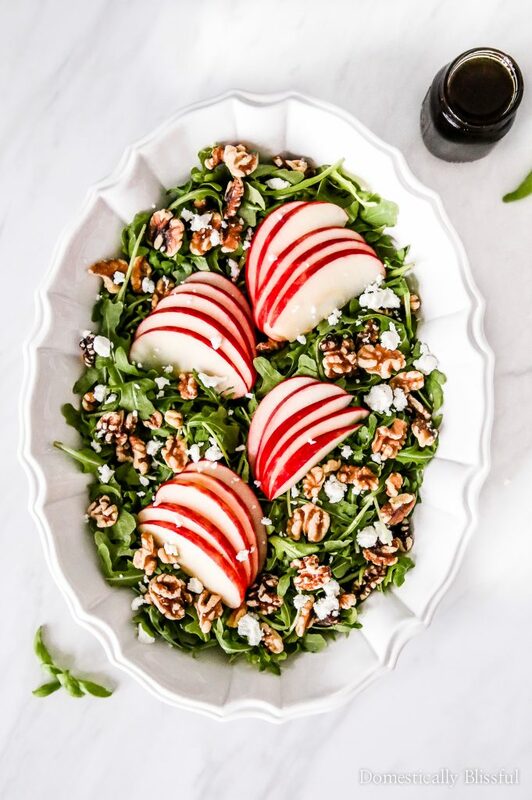 So recently, on a very busy Sunday, we sat down for a relaxing & enjoyable meal of Michael Angelo’s Eggplant Parmigiana paired with this fresh Apple Goat Cheese Arugula Salad. After a day outside working in the chilly air, we were so happy to sit down together with an easily prepared meal that is made with ingredients you can pronounce & that you can find in your kitchen. And with simple, clear & transparent labeling you can read for yourself how there are no artificial colors, flavors or sweeteners. 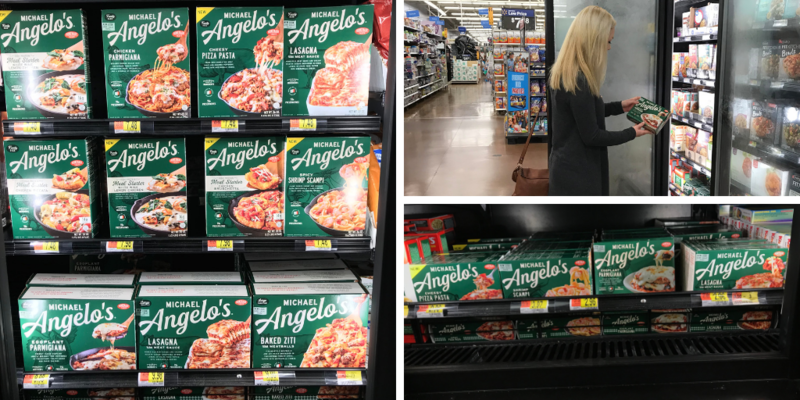 As Roger & I were strolling down the freezer section at Walmart we found the Michael Angelo’s products available in two sections, both in the single serve section & family meals section. So you can easily find what you are looking for based upon your mealtime needs! 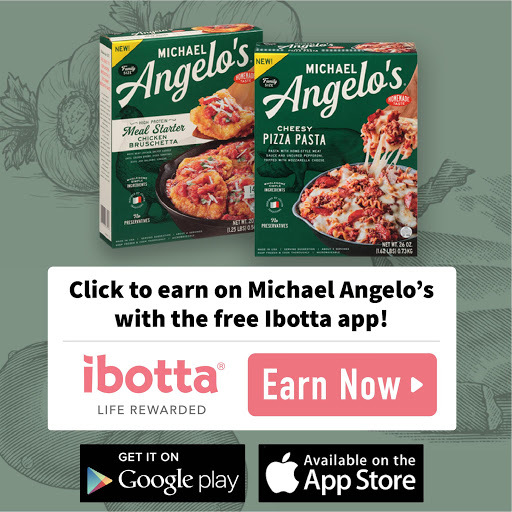 You can Earn Cash Back with Ibotta on your favorite Michael Angelo’s products, while supplies last by clicking here. And my weekday lunchtime needs are something quick & tasty! 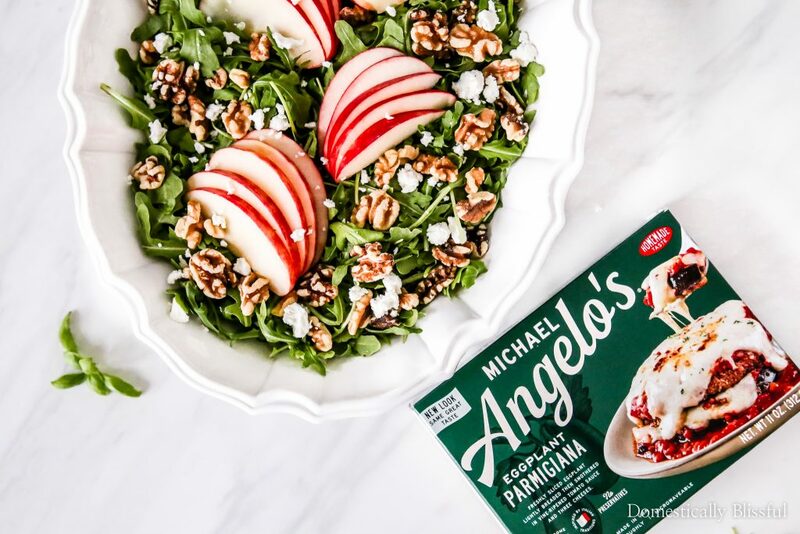 Luckily, Michael Angelo’s doesn’t make any compromises, & they don’t use artificial preservatives, flavors or colors for full, vibrant, homemade tastes in every bite. Plus, their authentic Italian-style recipes & kitchen-crafted meals are made with wholesome, simple ingredients specially selected & cooked to bring out their full flavor. Roger & I really enjoyed our Michael Angelo’s Eggplant Parmigiana & Apple Goat Cheese Arugula Salad. 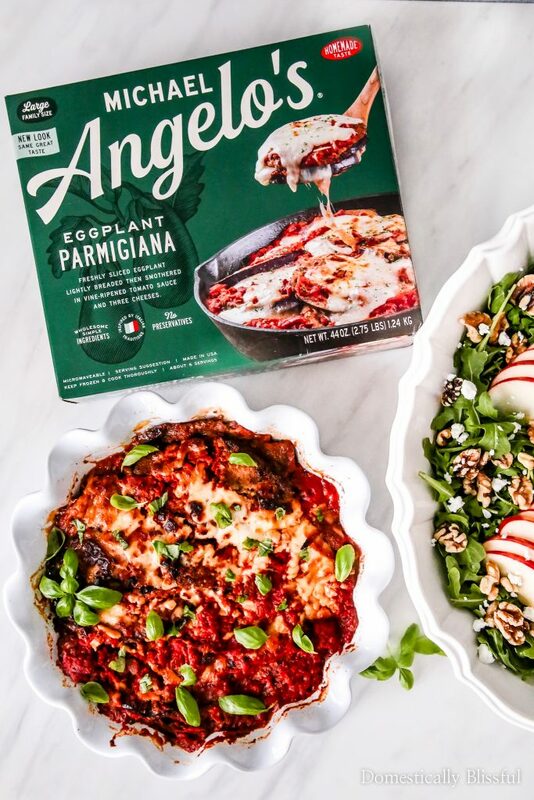 We baked the Michael Angelo’s Eggplant Parmigiana & our home smelled amazing as the dish simmered in our oven. When something yummy is baking in the oven I’m constantly having to shoo away Roger because every other minute he is opening the oven to look at it. And this Eggplant Parmigiana smelled delicious!! In a small glass jar add 2 tablespoons balsamic, 1/3 cup extra virgin olive oil, 2 tablespoons honey, 1 pinch salt, & 1 pinch pepper. Close lid tightly & set to the side. 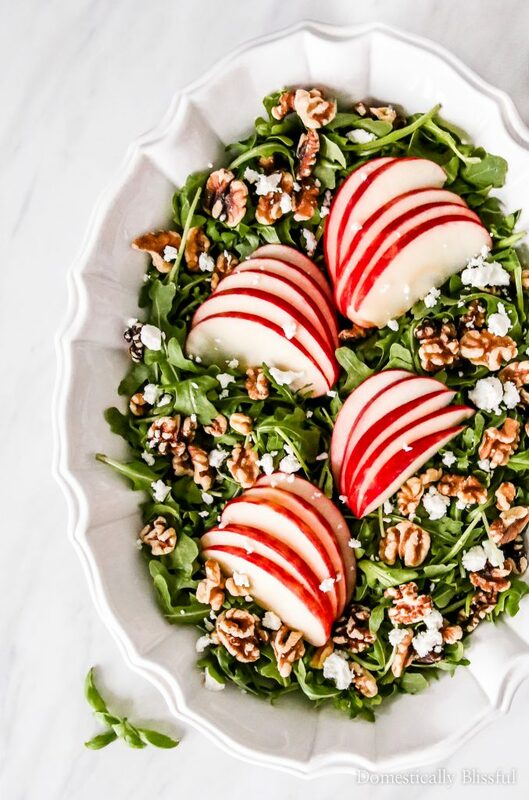 In a large bowl add the arugula, topped with sliced apples, goat cheese, & walnuts. Shake your Honey Balsamic Vinaigrette to combine ingredients before serving. 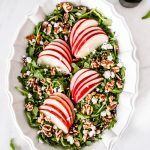 If you make this Apple Goat Cheese Arugula Salad this fall be sure to share a picture & tag @DomesticallyBlissful on Instagram so that we can all see your delicious fall food! What is your favorite fall Michael Angelo’s meal?